I have been writing several posts about French style. Ines de la Fressange, writer of Parisian Chic, once said that French women know the secret of aging with grace and the new first lady of France is definitely such a woman. 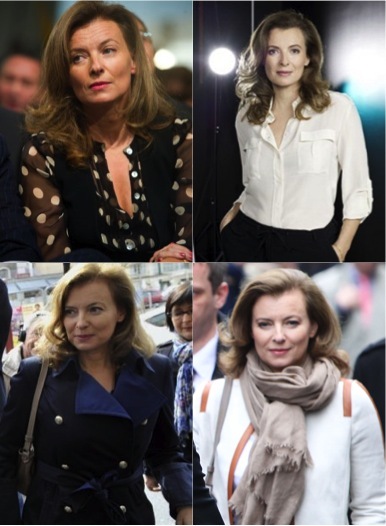 Valérie Trierweiler is the prefect example of easy French chic and looks gorgeous with her Botox free face (which could not be said about the stone face of Carla Bruni). Valérie has already sold herself as the “anti-Bruni”, who had a very expensive taste for Chanel suits and Chaumet jewelry. The new lady at the Elysée opts for a more tailored look, with clothes from high-street shops and mid-range labels. Her trademark look consists of a trench-coat or a blazer, a simple shirt, ample trousers and small heels. She is the true mirror of French women’s almost unconscious chic. Good choice France! This entry was posted in & Other Things, Fashion and tagged Carla Bruni, easy chic, French style, Valerie Trierweiler by sofischoice. Bookmark the permalink.